Pakistan’s literary scene is generally gloomy. Yet there is a genre of magazines popular among women, commonly known as Digests, whose circulation never seems to dwindle. These Digests cater to a predominantly female readership and exude a distinct literary tradition. In a country, where a book with 1000 plus printed copies makes history, these Digests have a print run of a hundred thousand plus copies, that circulate equally well across the Urdu speaking diaspora and never diminish in popularity. in a single collection. What more could a reader ask for? Among the different genres of newspaper writing, I have a clear bias for profile interviews where the journalist gets this one-on-one opportunity with a person of his or her liking. Easy as it may sound, it’s in fact the opposite; the research must be thorough, the recording machines in order, the details must be noted. The actual writing follows the tedious transcription part which is where the interview takes its real shape and acquires a life of its own. And, finally, the feedback which is tremendous in the case of a good interview. My friend Julien Columeau has won the distinction of being the first European novelist of Urdu language. He has spent years of his life in our corner of the globe and has a good grip over the language. Fascinated with the life of the dervish poet Saghar Siddiqi, during his stay in Lahore, Columeau novelised the poet’s life. The novel was published by the Nigarshaat publishing house of Lahore under the title Saghar. It movingly portrays the emotional life of the wretched poet who was never accepted by the society and lived a downtrodden life. There were some Englishmen who composed poetry in Urdu during the 19th century. Some of them even adopted the life style of poets of Dehli and Lucknow and participated in mushairas held in the Red Fort under the patronage of Bahadur Shah Zafar. However, Dr. Tabbasum Kashmiri, a renowned historian of Urdu literature, says that none of them tried their hand at writing fiction. These Digests include names like Khwateen Digest, Pakeeza, Shua and Kiran. Many today think the Digests have replaced the A4 sized Zaibunnisa and Hoor that were women’s staple diet some 40 years back. But actually there has been a steady chronological movement and the daily newspapers have a huge contribution in creating the right conditions for the present day Digests to thrive. The daily thus paved way for the weekly which then led to the monthly Digests in the 1970s because with Zulfikar Ali Bhutto came liberal ideas, and the veiled coy heroines of Zaibunnisa and Hoor had to be replaced with more emancipated women and hence the women’s Digests. Like their precursors, these include interviews, letters to editors, jokes, beauty tips, quotable quotes, Ahadis etc. But fiction remains the main attraction. A wide range of fiction is available within each magazine, from short stories, novelettes, novellas, serial novels to full complete novels. Some of the serials continue for three to four years and carry the most appeal because each episode ends at a very important spot and the suspense propels you to buy the next edition. One common feature every reader shares is the addiction part. Once you are hooked to the plot twists, the suspension of disbelief, the escape from reality into the world of Sania or Nadia, no matter how similar this world is to your own, there is no getting away. 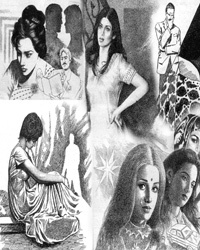 Pakeeza has been around for 37 years and has been persistently in print for the last 22 years. However, the pioneering digest was Khwateen Digest. Khwateen Digest was launched in April 1972 by Mahmood Riaz. Readers Digest and Urdu Digest used to serve the English and Urdu readerships respectively and an exclusive magazine for women in a bag-sized digest-form was the demand. Anam Chatha, 26, has been reading these magazines for ten years now. “I started reading Shua and Khawateen in the first year of college, through a friend. Eventually, I started buying my own copy.” She admires the works of Umaira Ahmed, Faiza Iftikhar, Nimra Ahmad, Maryam Aziz and Maham Malik the most. One wonders if the content of the stories has evolved over the years. These days, a very diverse range of authors write for these publications. Especially, in the last decade, younger and more educated women have taken up writing for Digests as a career. Regular readers confirm that the content is constantly evolving — minorities, lawyer’s movement including the person of the chief justice and women in politics have all appeared in these magazines as issues. Umaira Ahmed, one of the major writing talents to emerge from Digests, differs with the editors who happen to be men in most cases. “It is unfair to assume that the whole society has evolved but these Digests haven’t,” says Umaira. “In the last ten years religion has gained the limelight. The major hits, which eventually became novels and TV plays, had this theme.” She adds that even issues like homosexuality, extremism, Afghan war and working women have been the subjects. “Editors have a somewhat negative role here because they discourage novelty, especially among emerging authors. This also gives way to plagiarism because writers pick up material from other stories.” She adds that if one story is a hit, similar stories are written to please the readers. Print media has faced the major brunt of Pakistani electronic media revolution. These Digests are no exceptions. Aamer Mehmood, the editor-in-chief of Khwateen Digest confirms that maintaining readership is becoming more challenging. “Our readers now watch television, news and plays. This means we have to upgrade our content in the face of increasing competition.” He says that despite all the new channels, Khwateen Digest’s publication is increasing. It is true that the best writers from the Digests have been appropriated for script writing on television. Umaira Ahmed may have been the best of the lot but Seema Ghazal is indeed the most popular. The trend is nothing new because, eons ago, Bushra Rehman’s novel was picked up to be televised while she also wrote for these Digests. The reason why these writers are venturing towards tv is money. Where a short story fetches you Rs1000 rupees, a novelette Rs2000, a novel Rs4-5000, television starts with a minimum of 10-25000 per episode. Plus, the fame and publicity is much greater. Meanwhile, women stay hooked to these Digests that arguably serve as a unique mirror of our times. 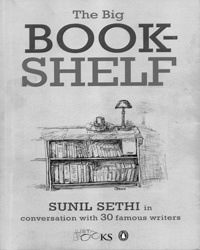 It was only natural that I grabbed this new book called ‘The Big Bookshelf’ by an Indian journalist Sunil Sethi whose title boasts of conversations with nothing less than “30 famous writers”. I was a little disappointed to read the flap; these were televised interviews mostly from NDTV’s famous literary show Just Books rendered in a book form. Not exactly in The Paris Review mould, I thought. The rather lengthy but brilliant introduction by interviewer Sethi, however, set the tone. There could not have been a better justification as to why it was important to place these 30 odd writers in the “permanent home” of a book from the “ephemeral TV screen”. And yet the interviews in the beginning seem shorter than they should, considering that they form a part of a book. But, as Sethi explains, these were conversations with authors soon after their last book was published and the dialogue was invariably built around that last book. Thankfully, this is not the general principle; in many cases two or more interviews are combined for the purpose of the book, leaving the reader amply satiated. Besides, the introduction at the beginning of each interview rightly sums up the literary history of the writer, his life and works, the controversies and the context. There are, of course, writers’ photographs before each interview; the introduction carries all details that are perhaps irrelevant for a television viewer but are expected by a reader — including the year of birth, the physical description of the interviewee and the place. It must have been quite a task to pick 30 people from a long list of 300 interviews conducted over six years. The sweep is broad including award-winning novelists and poets, unstoppable best-sellers, historians, economists, jurists and crusaders from all over the world; almost half of these are Indian writers but majority of them have lived abroad. As a matter of fact, migration is a leitmotif that runs through the entire book to the extent that one is almost convinced that the act of leaving home and families and comfortable careers is the only thing required to become a great writer. Majority of the people in this book have taken the plunge and some have even underscored its importance in so many words. Not all interviews are conducted in India (some were conducted on the sidelines of the Frankfurt Book Fair or elsewhere) but India remains the central concern of the book. 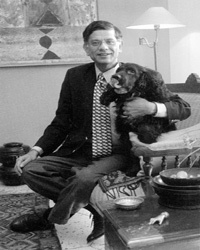 The marketing and publishing considerations bring people like Jeffery Archer to India; others like Nobel Prize-winning author Gunter Grass were fascinated by India and used it as an inspiration (he spent a good six months on the streets of Kolkata and produced a book); still others made India their home like William Dalrymple and Mark Tully. The Indian authors’ literary world is obviously inhabited by local characters even if they move back and forth between continents. My personal favourite are those with Umberto Eco, Gunter Grass and Salman Rushdie; they only prove how great minds can gratify us even in small doses. The pleasant surprises are reserved for interviews with best-selling authors like Jeffery Archer, Shobha De, Ken Follet and Alexander McCall Smith. Writers from Pakistan who have been included are Nadeem Aslam, Mohsin Hamid, Daniyal Mueenuddin and Bapsi Sidhwa. This was my first chance to hear Salman Rushdie revisiting the fatwa and in such detail. He is most impressive when he defends the right to freedom of expression while acknowledging the sensitivity argument for censorship and discarding it. Each interview is unique and must be read slowly. You can’t and should not rush through this book. There is so much to imbibe: the technique, the discipline of writing, the philosophical insights, vicarious introduction to some other great writers. The collection is indeed a booklovers’ delight and may serve as an inspiration to the aspiring writer. After reading the book, I had a chance to watch the great Orhan Pamuk’s interview with Sunil Sethi on Youtube who, I must confess, did not carry the television persona as well as his writing. It is, therefore, a wonderful idea to bring the writers back into the book format. The Big Bookshelf does not draw an exhaustive literary map which is impossible anyway. But it does guide us through the wondrous ways of letters that leave us both with a sense of pleasure at having discovered a new writer and his works, and a sense of creative anxiety and frustration to do some good writing ourselves. Julien Columeau is not English. He is Frenchand the French have a long tradition of oriental studies. The French Asiatic Society was established in 1821 with Garcin de Tassy its founding secretary. An eminent scholar of Hindi and Urdu, which was then known as Hindustani, he compiled a history of literature of these language, Historie de la literature Hindouie et Hindostani in two volumes which were published from Paris in 1839 and 1847. Garcin de Tassy was a member of the Anjuman de Lahore but never visited India. He also compiled and translated into French the poetry of Wali Dakkani who is still usually billed as the first Urdu poet. France produced some other Urdu and Hindi scholars, but none of them could earn as much fame as de Tassy did. They were linguists, critics and historians, but did not make any contribution to creative literature. Impressed by his work, I once asked Julien Columeau if any book on de Tassy’s life was available in English. Replying in the negative, he added that nothing has been written on him even in French. Dr. Muhammad Ikram Chughtai recently wrote a fine research article on the life and work of Garcin de Tassy. It has been published in the latest issue of Me’yar, the biannual research journal of the Urdu department of the International Islamic University, Islamabad. Julien’s first novel has not sapped his urge to write. Nowadays, he is working on another novel. This time he has chosen Miraji as his subject who was undoubtedly more fascinating as a person and poet than Saghar Siddiqi. He says his second novel will reach the readers before the end of current year. Dr. Khurshid Rizvi’s 703-page book Arabi Adab qabal az Islam (Pre-Islamic Arabic literature) tells us all that we may like to know about ancient Arabic poetry and poets, yet it is not a complete book. Rizvi says it is only the first volume and the second is soon to be made available to readers. Rizvi started work on this project some four decades ago dreaming to complete it in ten tomes. However, as it usually happens, other engagements of life kept him from the work for a long time. It is now being finished in two volumes. The first volume, published by the Idara-e-Islamiyat of Lahore, opens with the early history of the Arabs, their language and literature and also carries separate chapters on the poets to whom ancient literary masterpieces, commonly known as Seven Suspended Poems (Mo’allaqat) are ascribed. Some books have earlier been written in Urdu on this subject, but Rizvi’s is perhaps the most heavily researched as it also contains discussions on various topics related to ancient literature and sound arguments have been advanced to meet some objections raised by Orientalists like Margoliouth, C.J. Lyall and Clement Huart. Mustansar Hussain Tarar has been a leading figure in Pakistani literature for the past four decades and has indeed achieved new heights of popularity. He is a prolific writer and has continued writing since 1970, when his first book Nicklay Teri Talash Mein saw the light of day. He entered the world of literature with travel writing after hitch-hiking through a good part of Europe. Tarar is usually acclaimed more for his travelogues, but his novels have far more literary significance. His novels Bahaoo, Rakh and Khas-o-Khaashaak Zamaanay are indeed world class pieces of fiction. Mustansar Hussain Tarar turned 72 on the first of March. The event was celebrated at Model Town Park in Lahore where he comes daily for morning walk and has been accorded the status of a guru by scores of fellow walkers. Reaching the age of 72, however, does not mean that he has entered the declining phase of his life. Having Punjabi Jat blood in his veins, he is still alive and kicking. He is writing. You can expect a new volume from him in the next ten weeks. But do not forget to wish him a happy birthday.